A healthy and fun guide to eating, drinking and living! 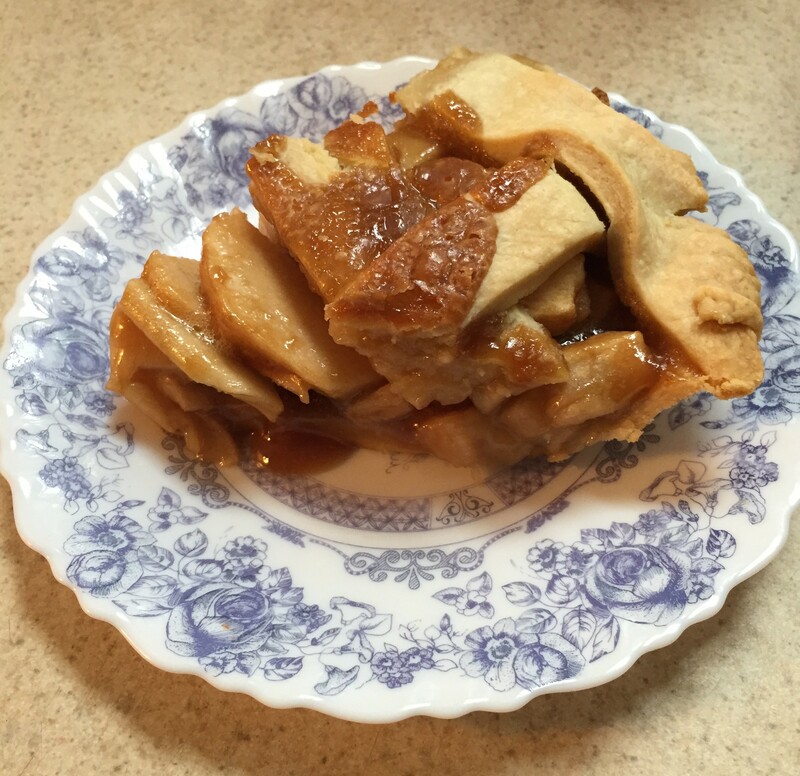 Apple Pie can be tough, but when you take that first bite of goodness it is extremely rewarding. Have you ever thought about the science behind an apple pie? 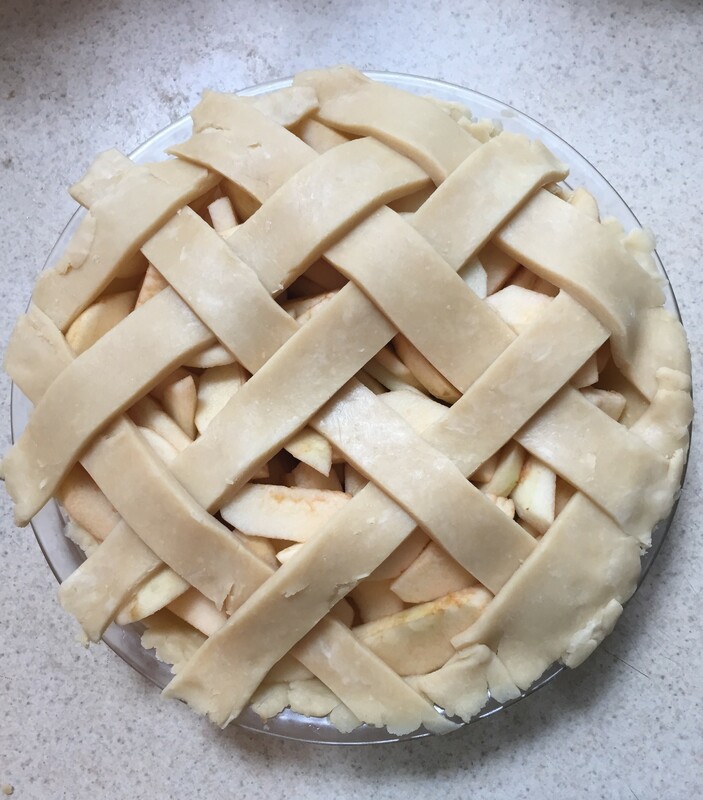 When I first made this pie it was for a Food Science project in college where me and two other girls made this pie and had to explain the science behind all of the ingredients and the entire process of the pie. 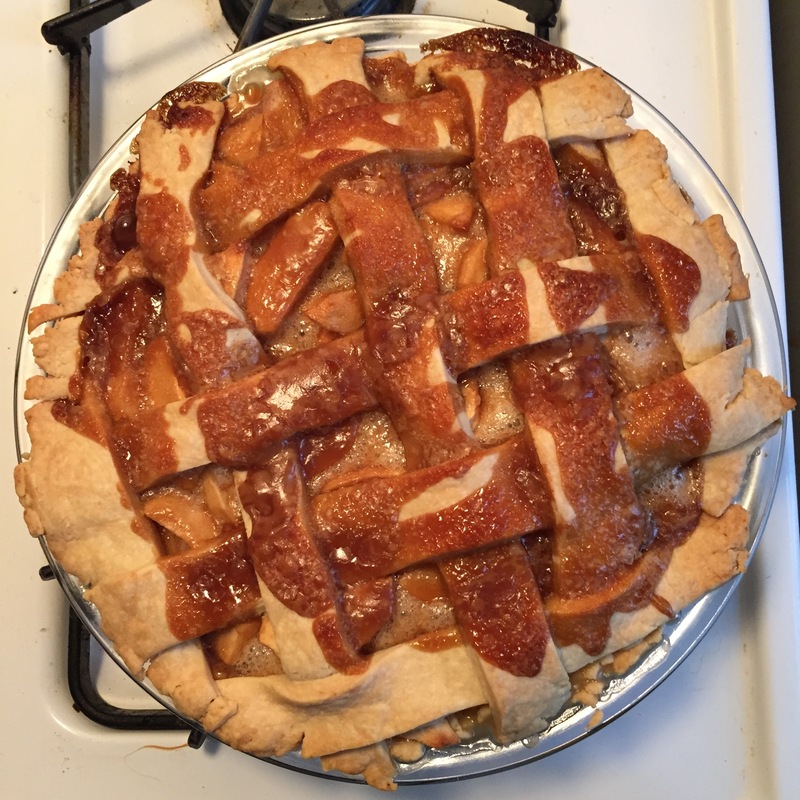 Below is the recipe as well as an explanation of some of the science behind an apple pie. After refrigeration, roll discs separately until flat. Shape one disc into pie plate. Cut the other flat disc into 1-2 inch strips for the lattice. Generally speaking, gluten is made from two proteins known as gliadins and glutenins. These proteins create a gluten matrix when they are hydrated with cold water and manipulated physically (kneading dough). This initial step allows for hydrophobic reactions to take place. Further, these applied forces allows for the two gluten proteins to absorb water and partially denature or break down. These broken down proteins react further and allow strands or polymers to form. These polymers undergo hydrogen, disulfide, and hydrophobic interactions and form a viscoelastic gluten matrix which is able to capture and hold gas. When adding fats, like butter, to the flour proteins, this disrupts the process of forming the gluten matrix. 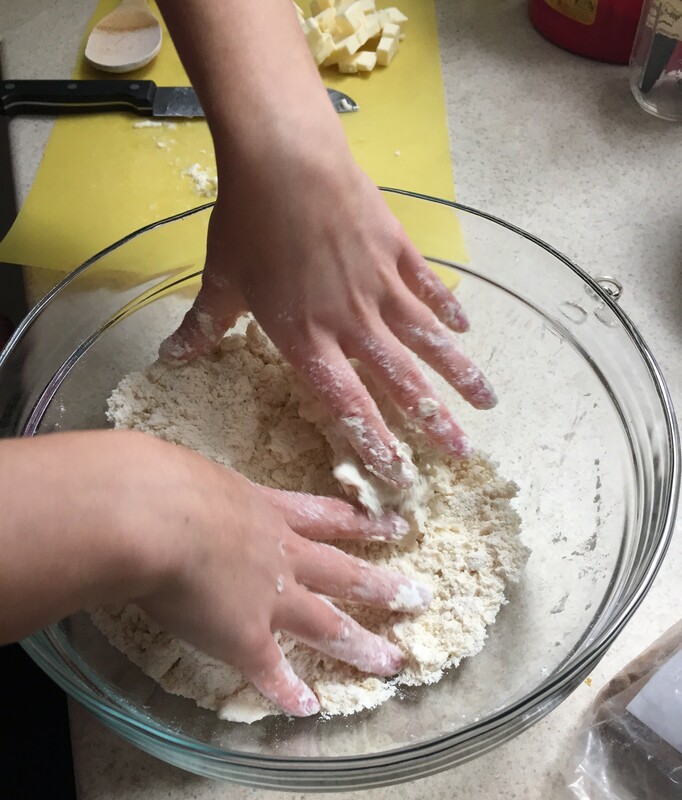 The solid shortening literally “shortens” the length of the gluten network strands, allowing for flaking of crust and dough layering instead of a fluffy bread consistency. 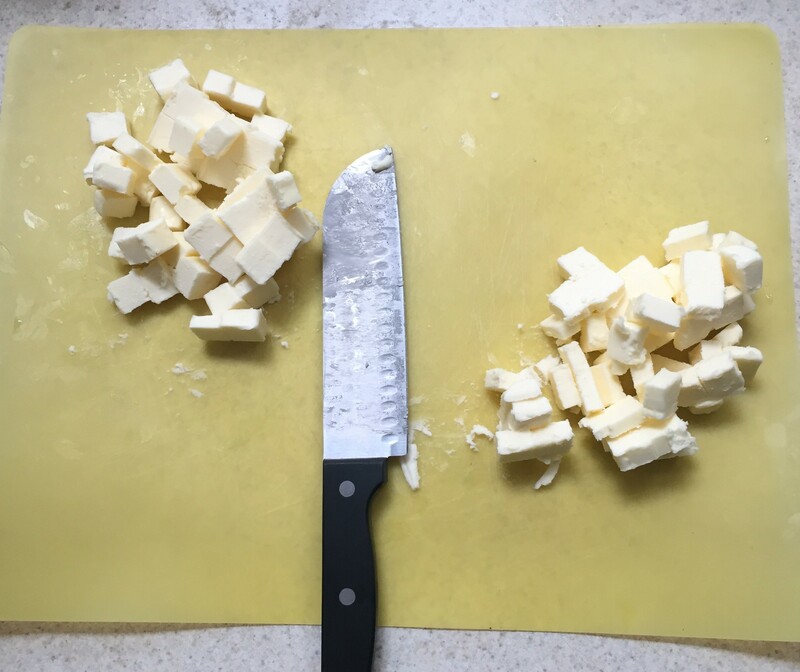 The butter was cut into pea-sized chunks to allow for the fat to melt in pockets throughout the dough and give flaky layers to the crust. 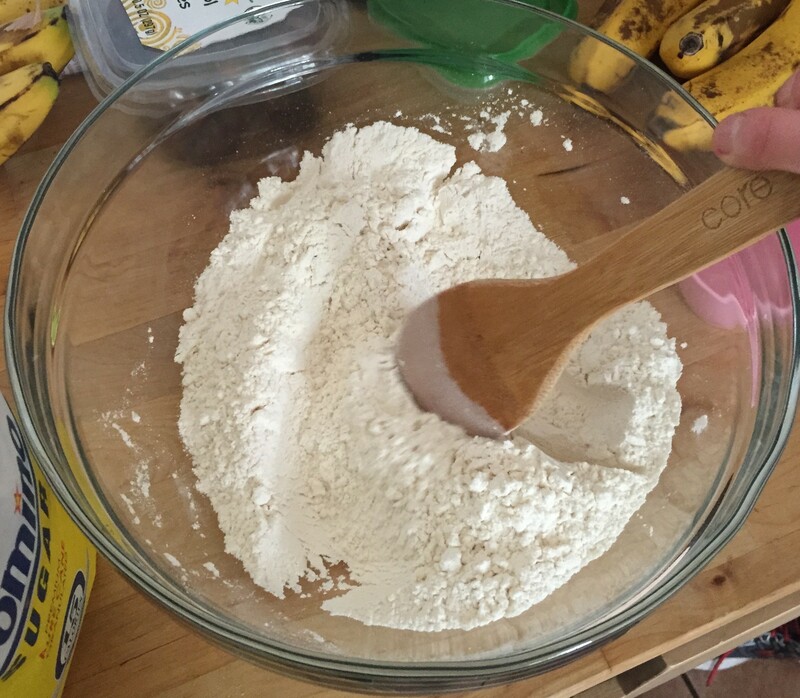 When cold water is added to the flour and butter, this allows for separation of starch granules and prevents lumps and unequal swelling of the starch. The salt helps control the gluten formation so that less occurs. The sugar competes with the starch for water absorption, which allows for less water for gluten formation. 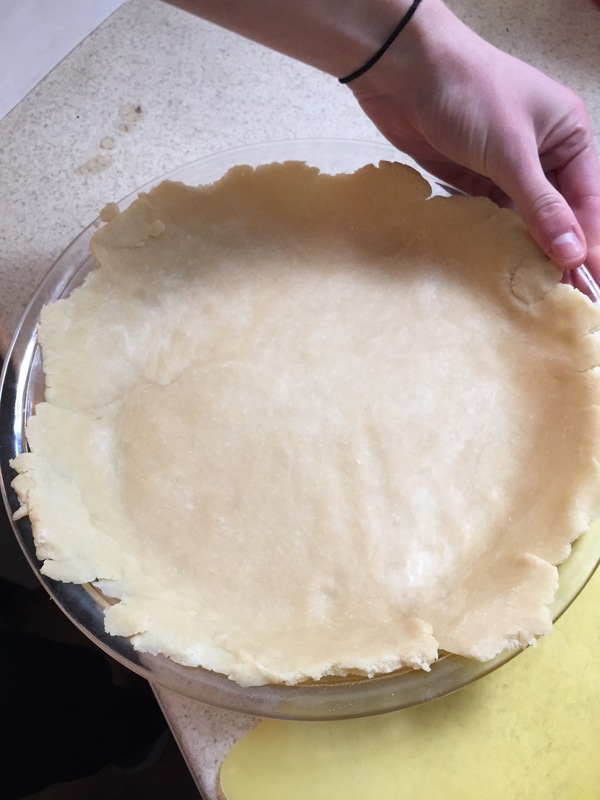 Overall, too much gluten formation is undesirable for a pie crust because pie crusts should have flaky layers instead of fluffiness like bread. 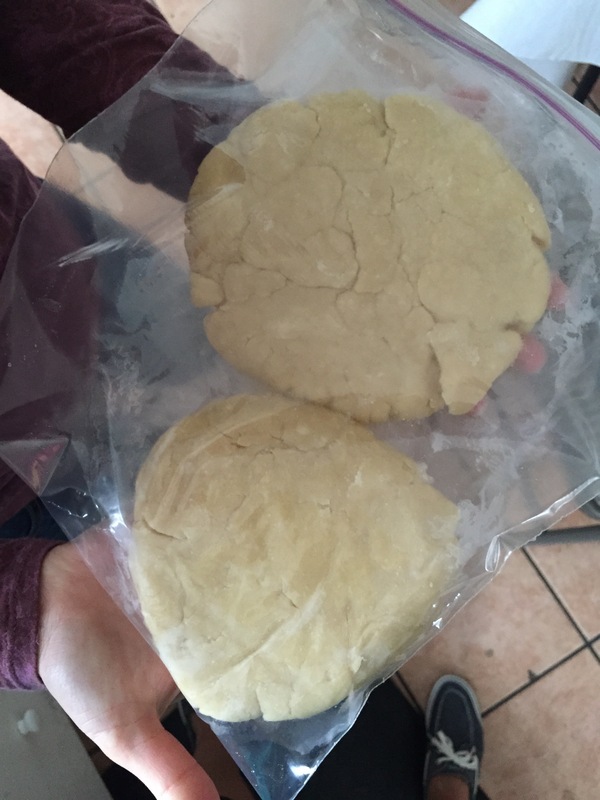 The dough is chilled before it is rolled out mainly to maintain a flaky desirable crust. 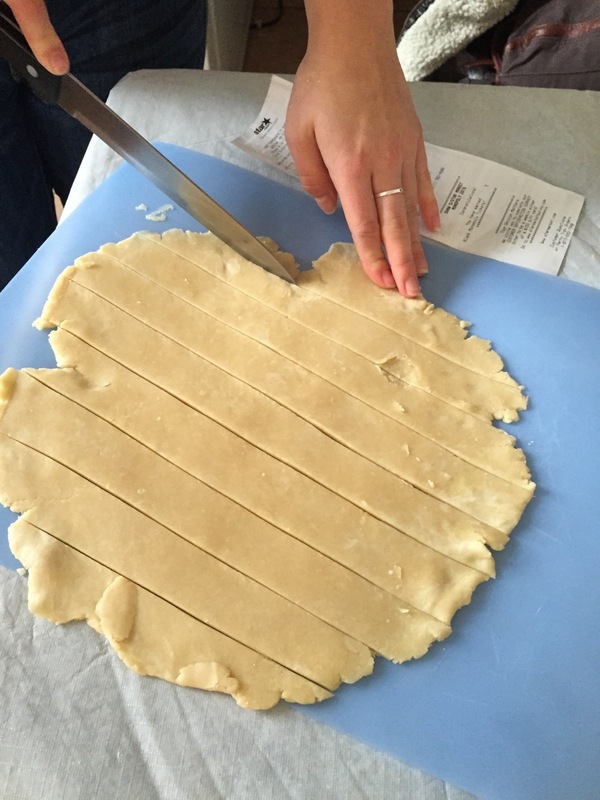 Further, this allows the gluten strands time to settle down and relax and makes the pastry dough easier to roll out. A big part of pie filling is starch thickening. A starch granule is made up of many starch molecules. In starch thickening a process of gelatinization occurs where hot water molecules break the hydrogen bonds between each of the starch molecules. This occurs at about 140 degrees. When the bonds are broken between the starch molecules this allows for the starch molecules to bind to the water molecules instead of binding with other starch molecules. This allows for the starch granules to swell. Amylose, a type of sugar, leaches out of the starch granules into the mixture and increases the thickness. This process creates a thick paste where the starch is further cooked to develop more flavor. Simply put, starches thicken at 140 degrees, but starches high in amylose such as flour, need to be brought to a boil and then simmered in order to cook off all of the starch flavor. 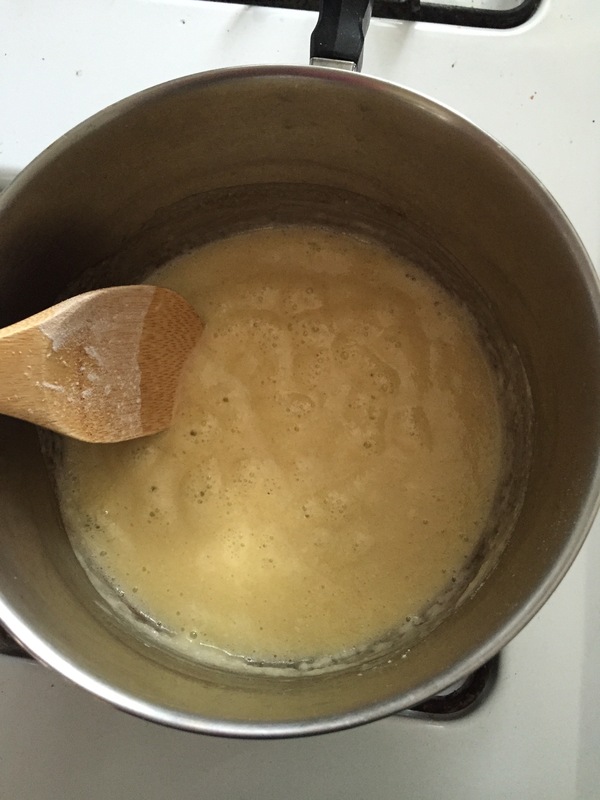 Final thickening occurs at 205 degrees. If the heat isn’t turned down after boiling occurs, the starch molecules may be too disrupted and may lose their ability to trap water and thicken. 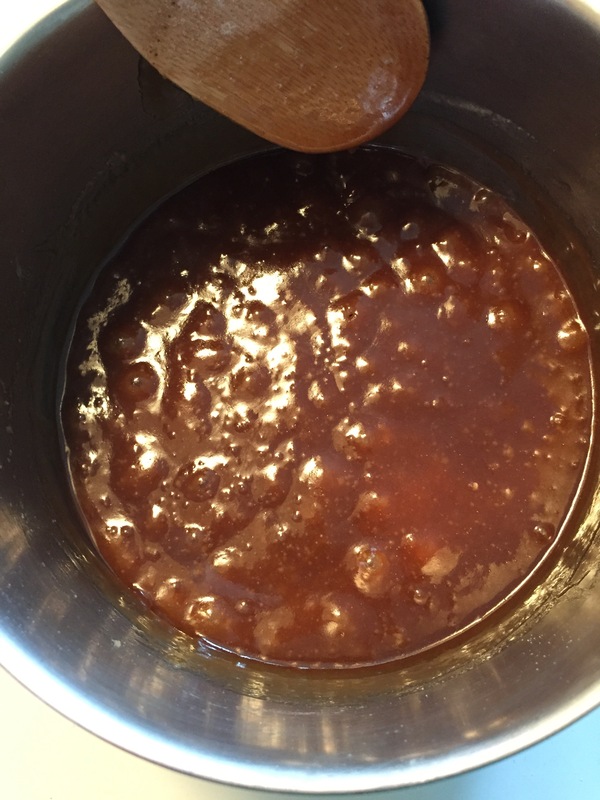 This process creates a desirable color and texture for the apple pie filling. When the pie is cooked a process called non enzymatic or Maillard browning occurs, where a carbonyl group of a reducing sugar reacts with heat and an amino group of an amino acid. 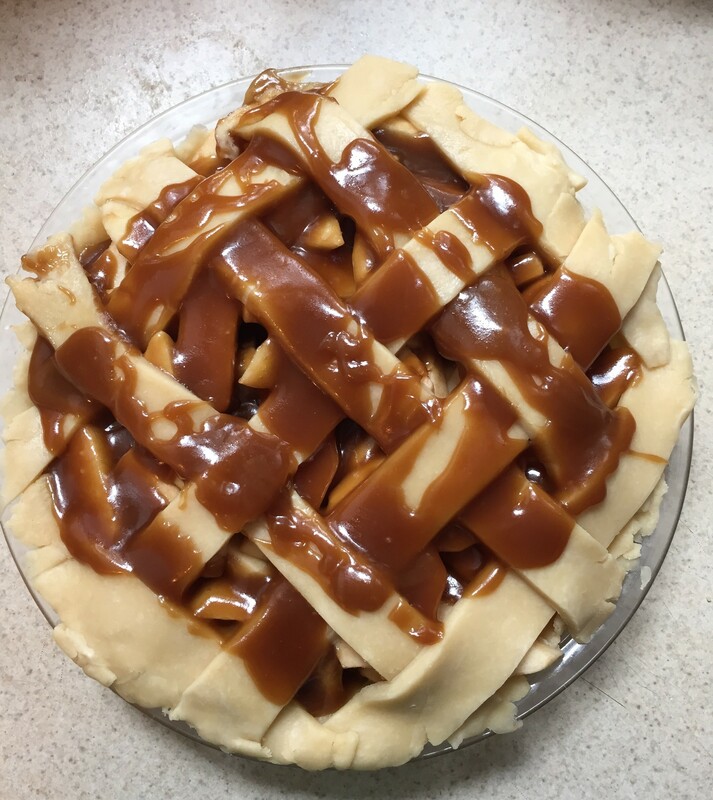 This reaction forms a melanoidin polymer which is responsible for desirable brown color, smell and caramel flavor of the pie. As the pie is heated in the oven the browning process occurs. 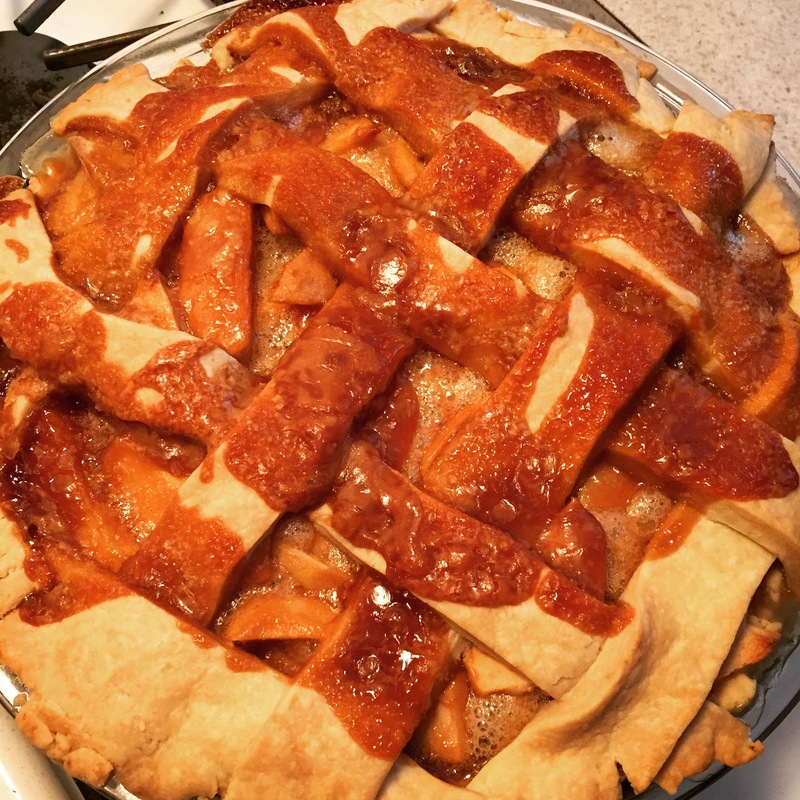 After the initial cooking at 425 degrees the oven is turned down to 350 degrees to finalize the golden brown coloring of the crust after the pie filling has been mostly cooked. Source: Vaclavik VA and Christian EW. Heldman D, ed. Essentials of Food Science 4th ed. New York, NY: Springer; 2013. Don’t let any of this information scare you! 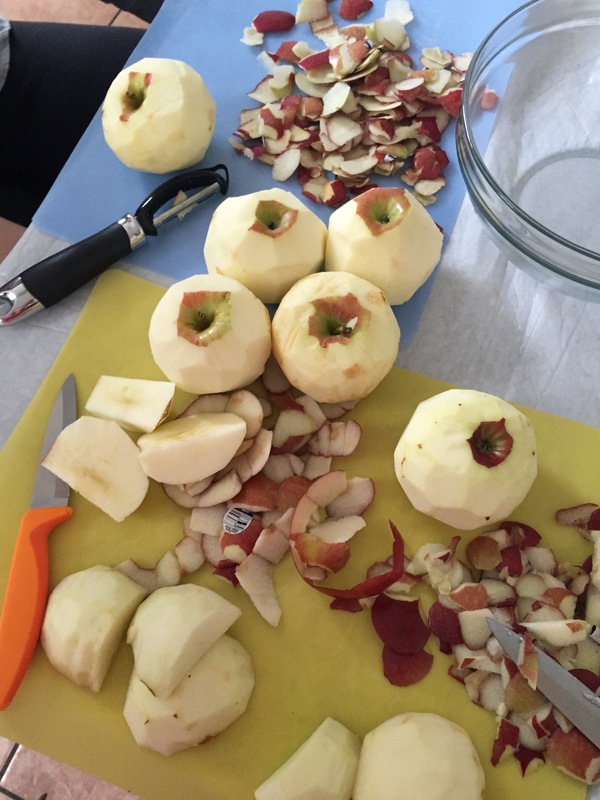 Who would have thought so much went into a simple apple pie. Maybe not so simple anymore…but that doesn’t mean it isn’t delicious!